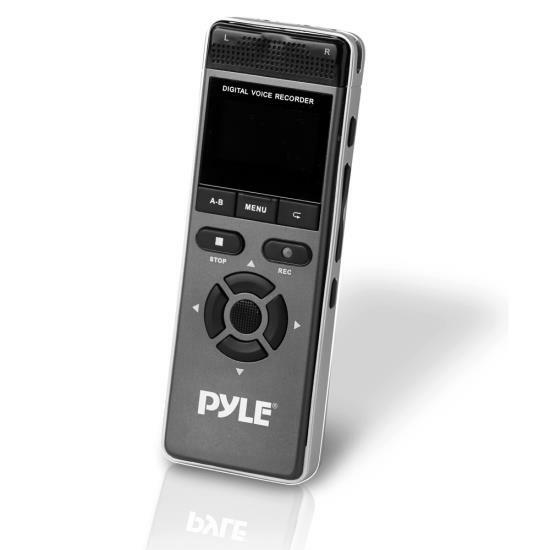 The Pyle PVRCM500 Digital Voice & Music Recorder can be used anywhere -- at home, in the classroom or in the office. You will gain access to convenient and hassle-free audio recording ability that fits in the palm of your hand. The system features the unique voice detection ability, allowing the system to automatically detect and begin recording once it recognizes someone speaking. Simple button operation allows you to instantly record and save audio files that are easy to share. Built-in rechargeable battery provides up to 27 hours of recording on a full charge. Included USB charging & connection cable allows you to connect the system to your computer to further save and transfer your audio files. Additional features include 8GB built-in memory, digital LCD display screen, microphone and headphone jacks (3.5mm), built-in speaker for instant audio playback of your recorded files and more. Enjoy versatile voice and music recording ability with the Pyle PVRCM500.